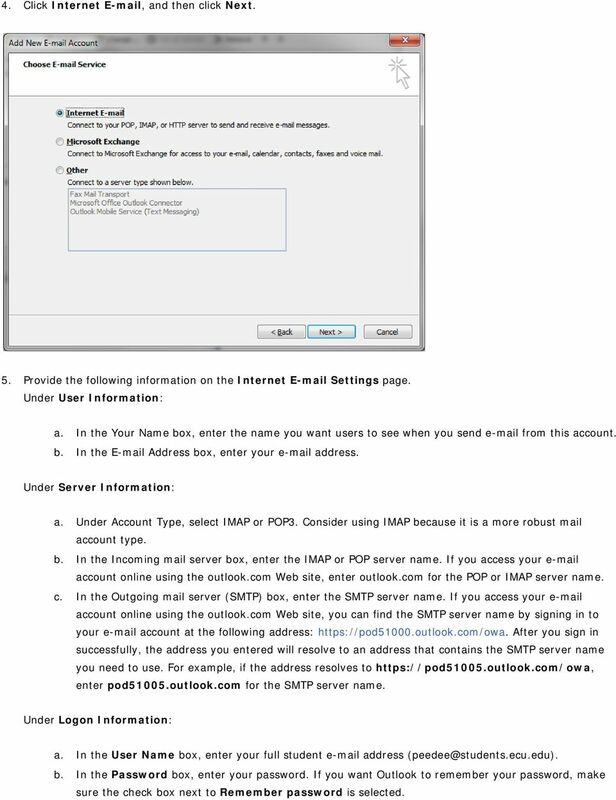 Download "Set up Outlook for your new student e mail with IMAP/POP3 settings"
1 Set up Outlook for your new student e mail with IMAP/POP3 settings 1. Open Outlook. The Account Settings dialog box will open the first time you open Outlook. If the Account Settings dialog box doesn't open when you first open Outlook, do the following: a. On the Tools menu, click Account Settings. b. In the Account Settings dialog box, on the tab, click New. 2. 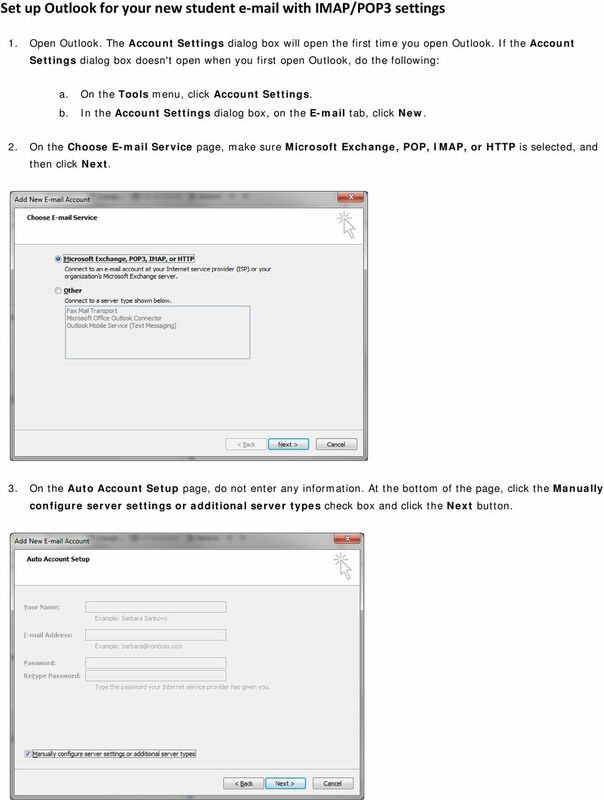 On the Choose Service page, make sure Microsoft Exchange, POP, IMAP, or HTTP is selected, and then click Next. 3. On the Auto Account Setup page, do not enter any information. 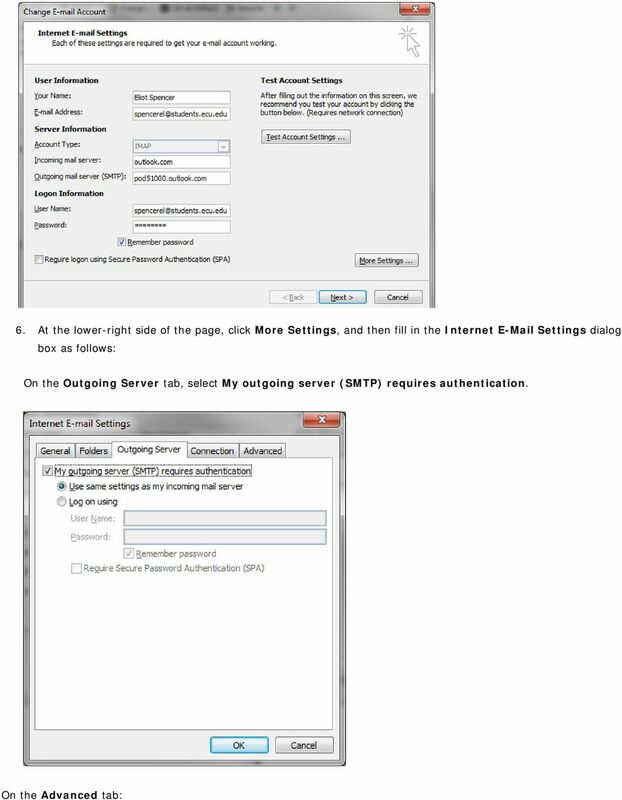 At the bottom of the page, click the Manually configure server settings or additional server types check box and click the Next button. 2 4. Click Internet , and then click Next. 5. Provide the following information on the Internet Settings page. Under User Information: a. In the Your Name box, enter the name you want users to see when you send from this account. b. In the Address box, enter your address. Under Server Information: a. Under Account Type, select IMAP or POP3. Consider using IMAP because it is a more robust mail account type. b. In the Incoming mail server box, enter the IMAP or POP server name. If you access your account online using the outlook.com Web site, enter outlook.com for the POP or IMAP server name. c. In the Outgoing mail server (SMTP) box, enter the SMTP server name. If you access your account online using the outlook.com Web site, you can find the SMTP server name by signing in to your account at the following address: After you sign in successfully, the address you entered will resolve to an address that contains the SMTP server name you need to use. For example, if the address resolves to enter pod51005.outlook.com for the SMTP server name. Under Logon Information: a. In the User Name box, enter your full student address b. In the Password box, enter your password. If you want Outlook to remember your password, make sure the check box next to Remember password is selected. 4 1. Under Incoming server (IMAP), or Incoming server (POP3), next to Use the following type of encrypted connection, select SSL in the drop-down box. Or in the case of POP3, check the This server requires an encrypted connection (SSL). 2. Under Outgoing server (SMTP), next to Use the following type of encrypted connection, select TLS. 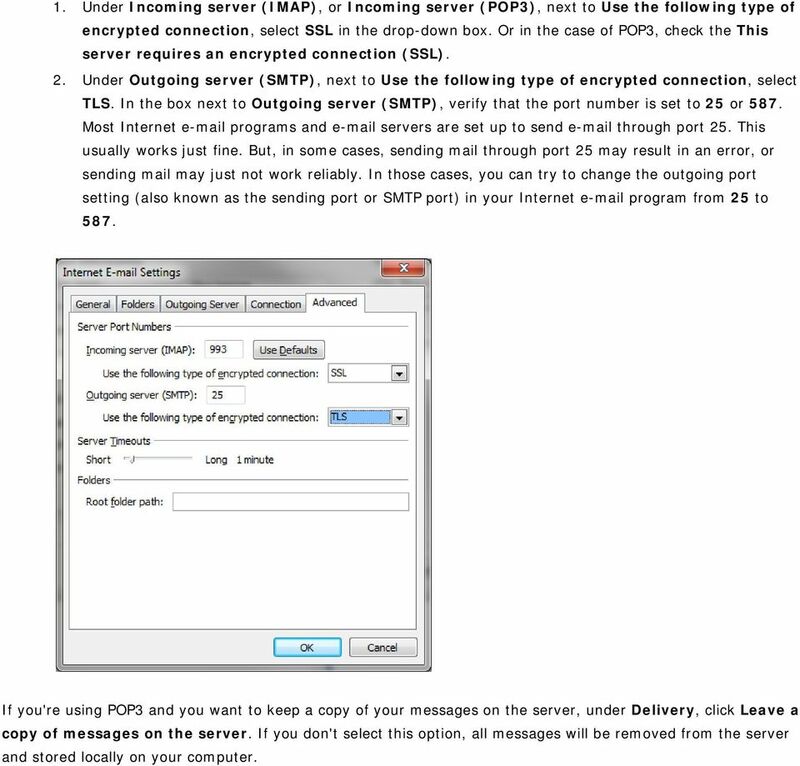 In the box next to Outgoing server (SMTP), verify that the port number is set to 25 or 587. Most Internet programs and servers are set up to send through port 25. This usually works just fine. But, in some cases, sending mail through port 25 may result in an error, or sending mail may just not work reliably. In those cases, you can try to change the outgoing port setting (also known as the sending port or SMTP port) in your Internet program from 25 to 587. If you're using POP3 and you want to keep a copy of your messages on the server, under Delivery, click Leave a copy of messages on the server. If you don't select this option, all messages will be removed from the server and stored locally on your computer. 5 Click OK. 7. On the Add New Settings page, click Next. 8. On the Congratulations page, click Finish. Close the Account Settings dialog box. 9. On the Account Settings page, click Close. 10. If you're using IMAP4, a message appears that asks you if you want to download folders for the mail server that you added. Click Yes. 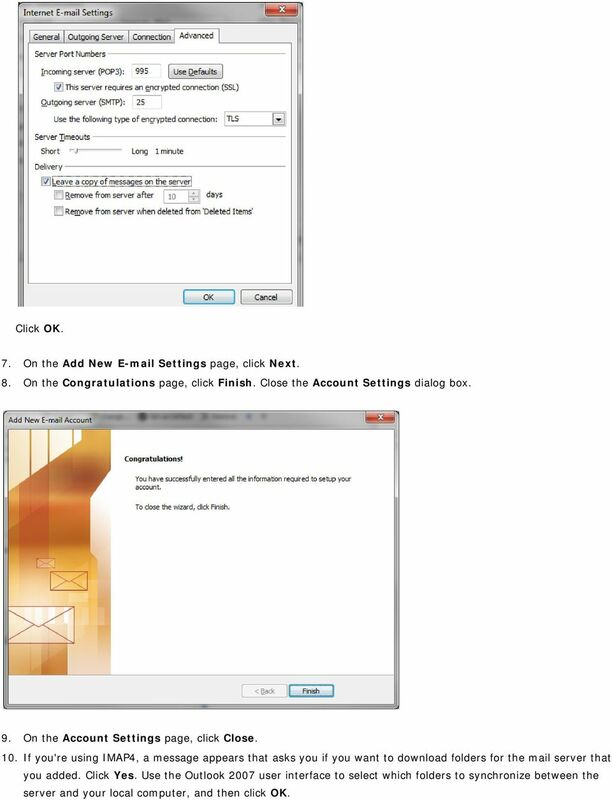 Use the Outlook 2007 user interface to select which folders to synchronize between the server and your local computer, and then click OK.